In Arabic, Qibla means direction. It is also the word that Muslims use to indicate the direction of Mecca. 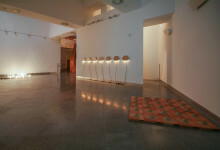 Thus titled, the work is composed of seven spherical, reflective light bulbs. Six of them are attached to the wall and trace a circle. 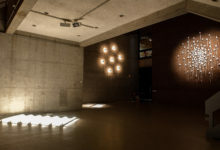 The seventh is placed in the center of the circle in such a way that when the viewer imaginatively connects them, the light bulbs form a cube. The electrical wires are brought together into a single line and left connected to the electrical plug in order to be clearly visible.